High specification project to install a new 114m, 3 span bridge over the River Clyst to extend the Exe Estuary National Cycle Route. Significant site access problems: The site is in an RSPB reserve and consists of soft ground with the Exmouth-Exeter railway bridge in very close proximity. It was logistically impossible to get a large enough crane with significant reach by road. It would have required the train line to be closed, created significant disruption and potential environmental damage. 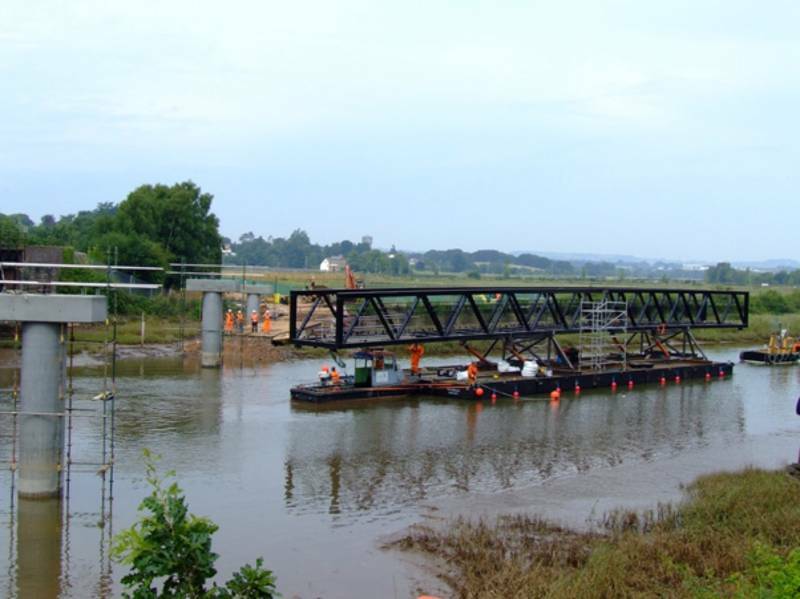 Drawing on our local knowledge, maritime expertise and our location on the Exeter Ship Canal, our solution was to float the bridge spans to site. 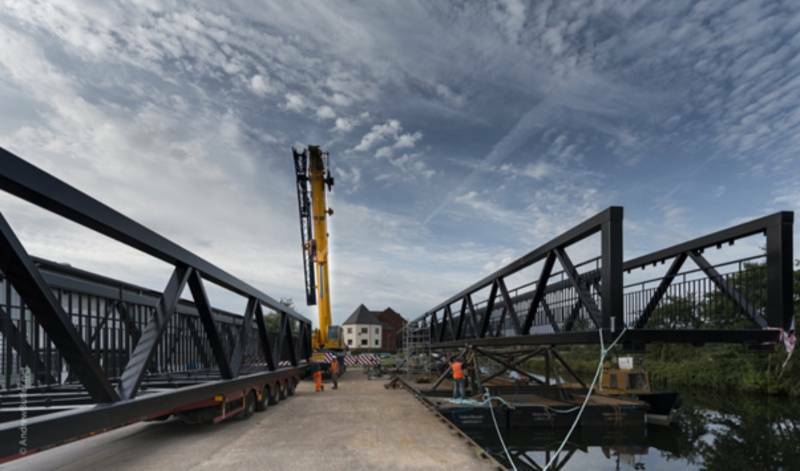 Working with our partners at Axminster Excavators we constructed a specialist bespoke hydraulic lifting platform built with a third party category 3 check (Cat III), to install the bridge from the waterway, maximising the opportunity presented by the spring tides. Each bridge span was made up of two sections and bolted together at our premises at Exeter Quay. 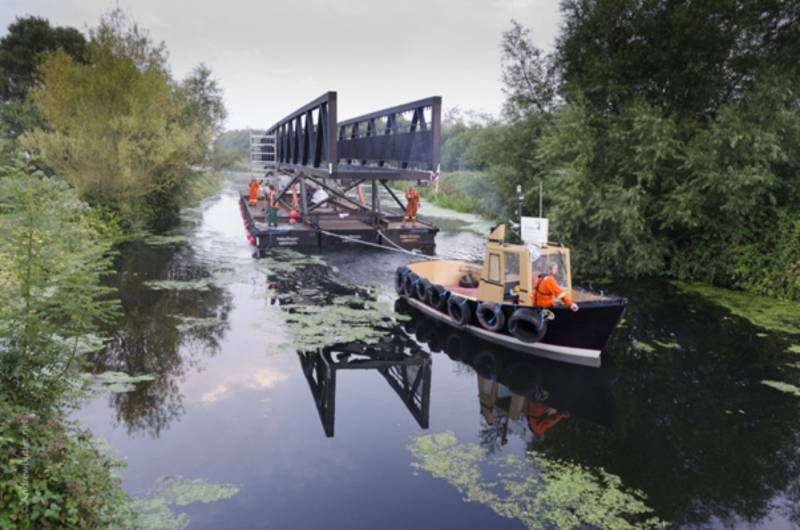 A 250 tonne mobile crane then lifted the bridge span onto the specialist bespoke hydraulic lifting platform fixed to a raft of 15 pontoons. The heaviest span weighed 33 tonnes and measured 42m in length. We had extensively surveyed our route along the Exeter Shipping Canal, into the Exe Estuary and across to the River Clyst channel and were confident of navigating the narrow channel, in places only the width of our barge. It was mapped, plotted, measured and marked out with buoys. The waterways are tidal and we had to work both sides of the tide with the additional element of spring tides to factor in. The bridge spans were guided 5 miles along the Canal by our two tugs, passing through two locks: Double Locks and Turf Lock and the swing/lifting bridge at Countess Wear. 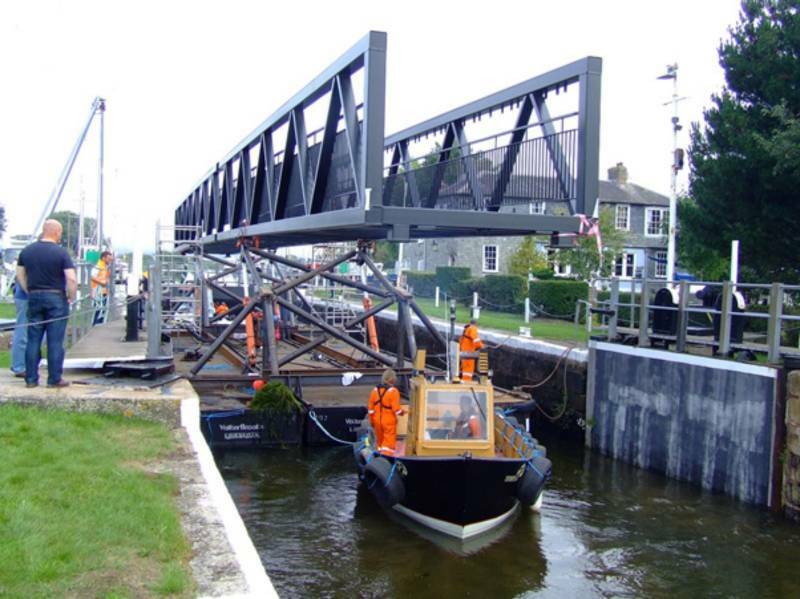 We had to leave Turf Lock at high tide because the bridge spans were longer than the Lock and as the water was drained from the lock to meet high tide in the estuary the bespoke hydraulic lifting platform was utilised to lift the bridge to prevent it from catching on the handrails at each end of the lock. Before we could float the spans under the railway bridge at River Clyst we waited at one of our pre-laid moorings for the ebb tide to drop enough so the bridge span could pass safely under the Exmouth-Exeter railway bridge and onto our second pre-laid moorings in the narrow River Clyst channel. We then waited for the flood tide and high water. Operating within very shallow, fast flowing tidal water, the bridge spans were raised above the piers, gently manoeuvred into position using our tugs and man power and when in the correct position, lowered onto pre made location cups on the piers, all within a tight 30 minute window over the high water period.